Always has been always will. Blogger has been a wonderful user-friendly platform to me over the past few years but I’ve been tending towards a different aesthetic since last year when I stepped away from baking and just observed the works of other bakers through Instagram or their blogs, which helped me solidify the image that I want to achieve with mine. The decision to move to WordPress was hardly a difficult one to make with its amazing selection of modern minimalist themes that I’ve been dreaming about for years. I’ve also decided to leave my old content behind on the first Crumbs and Cookies for the memories and a few amazing recipes that I still turn to every now and then. 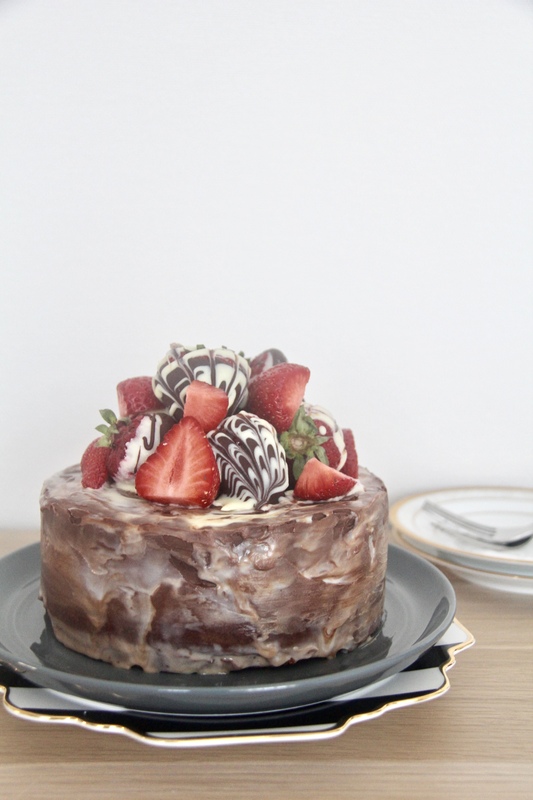 So this is a cake I made to celebrate the inaugural post on my new platform that is inspired by strawberries during the height of their season. Truly they are the sole redeeming element of the everlasting stretch of bitter, piercing cold that is winter. They are paired with two layers of fudgy chocolate cake with a density approaching pure chocolate – which is why choosing a good brand of chocolate is so imperative – and a marbling of white and bittersweet ganache to decorate. Not to forget marbled chocolate strawberries to match. 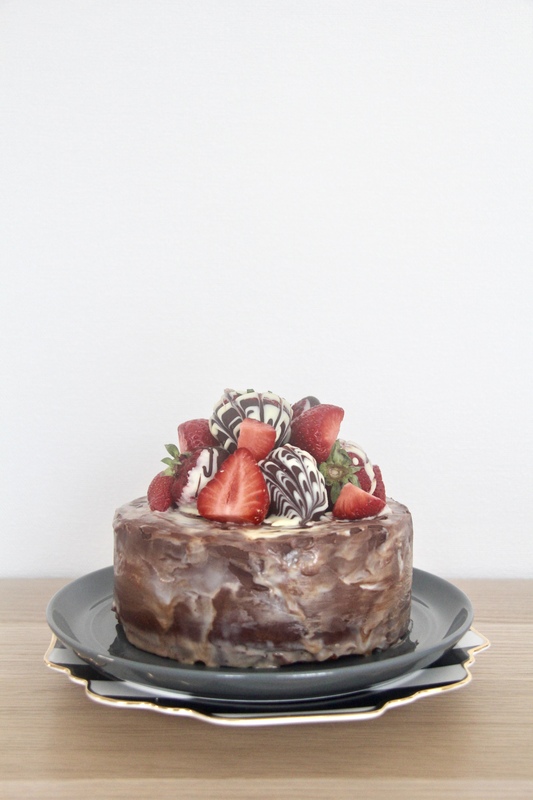 This is a cake that’s meant to be shared, although you might find yourself stowing away a generous slice in the back of your fridge, concealed from all eyes but yours. But share, as much as a controversial opinion this may be, because this cake is too good to keep a secret. Make the cake: Preheat oven to 350F or 180C. Butter and flour two 6-inch round cake pans, tap out the excess, and line the bottom of the pans with parchment paper. Beat the eggs and sugar together until the mixture lightens in colour. Mix in the flour until incorporated, mix in the chocolate-butter mixture. Divide batter equally between the cake pans. Bake for 16 to 19 minutes, rotating the pans halfway during the baking time. When the cakes are done, their tops will be dry and crinkly and a thin skewer or toothpick inserted in their centers will come out slightly moist or with just a few crumbs. Transfer the cakes to a wire rack and let rest for 3 minutes, then run a table knife around the edges and unmold them unto the rack. Allow cakes to cool to room temperature. Make the ganache: Place the chopped white and bittersweet chocolates in separate heatproof bowls. Bring the heavy cream to a boil in a small saucepan. Divide the cream in a ratio of 3:1 between the two bowls. Let the mixtures stand for a minute or so then stir the cream and chocolate together until you have a thick, smooth, glossy ganache. Leave the ganaches at room temperature, stirring them frequently until they are thick enough to spread on the cake. Make the chocolate-dipped strawberries: There are two ways you can go about this, depending on which colour you would prefer to show up more. Whichever you choose, start by dipping a strawberry in the melted bittersweet chocolate, for example. Cover as much surface area as you can. Pipe the white chocolate over in a zig zag motion, and drag a toothpick through the chocolates starting from the base of the strawberry to the tip. Refrigerate the strawberries until the chocolate coating is set. Assemble the cake: Place one cake layer right side up on a cake plate. Spoon some bittersweet chocolate ganache on top and spread it out evenly and smoothly with a spatula. Arrange slices of strawberry on top. Top with the second cake layer. Frost the entire cake with a thin layer of the bittersweet chocolate ganache. Chill the cake for roughly 30 minutes to allow the ganache to set. Using separate spatulas, take blobs of the bittersweet and white chocolate ganaches and alternate them all over the cake. Smooth the surfaces of the cake with a clean spatula. The two ganaches should blur into each other while still remaining somewhat distinct. Add more bittersweet or white chocolate ganache where necessary and smooth it over to achieve your desired degree of marble. Chill the cake until the ganache is completely firm, at least 2 hours. Arrange the chocolate-dipped strawberries on top, adding halved or quartered regular strawberries for a colour contrast as needed, if desired. *I found that this ratio of white chocolate produced a rather runny ganache. I managed to get it to a spreadable consistency by freezing it temporarily (although I’m not sure if this is encouraged) and I quite like the dimension it added to the marble with its slight translucency. For the sake of a less stressful experience, I would encourage you to add 10 grams to the amount stated in the recipe. Note: the cake recipe is borrowed from Dorie Greenspan’s Baking Chez Moi.